Last week we hosted a barbeque for our good family friends. I couldn’t decide what dessert to make, so I made three:) I wanted to make sure there was something for everyone to enjoy, plus, you all know I love an excuse to bake:) I decided to make brownies, because brownies are always a hit at parties. I didn’t want to make plain chocolate brownies so I jazzed them up with Twix candy bars and caramel. I think that was the best decision I have made in a long time! These Twix Caramel Brownies take brownies to a whole new level of deliciousness. I stirred the Twix candy bar chunks into the rich, chocolaty brownie batter. Again, I wanted to just eat the brownie batter and Twix chunks with a big spoon, but I refrained. It sure was hard though! I poured the batter into the pan and drizzled caramel sauce evenly over the brownies. 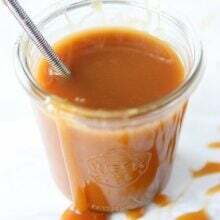 If you want, you can use my homemade salted caramel sauce. It is SO good! Next, I took a toothpick and swirled the caramel into the brownie batter. The brownies baked for about 40 minutes and that was the longest 40 minutes of my life. I love the smell of brownies baking and my chocolate craving was through the roof at this point. I couldn’t wait to get my hands on one of these decadent brownies. If you are looking for a simple and fun way to jazz up the traditional brownie, try this Twix Caramel Brownie recipe. Fudgy brownies with caramel sauce and chopped up Twix candy bars. These brownies are divine! Heat oven to 350°F. Grease a 9 x 13 pan with cooking spray. Set aside. Place butter in medium saucepan on the stove. Heat over medium heat until butter is melted. Remove from heat and stir in sugar and vanilla extract. Add eggs, one at a time, beating well with spoon after each addition. Add cocoa; stir until well blended. Add flour, baking powder and salt; stir until combined. 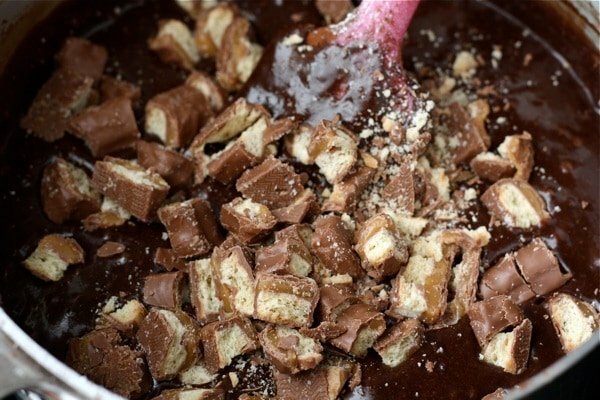 Stir in Twix candy bar chunks. Pour batter into prepared pan. 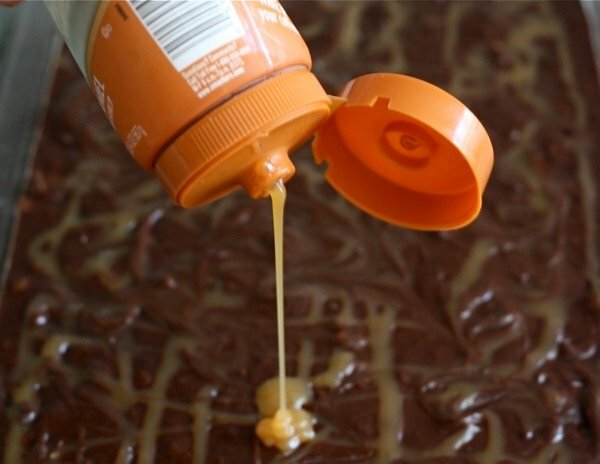 Drizzle caramel evenly over the brownies. Using a toothpick, swirl caramel into brownies. Bake for 35-40 minutes or until brownies begin to pull away from sides of pan and a toothpick inserted in the middle comes out clean. Cool brownies completely in pan on a wire rack. Once cool, cut into squares and serve. Are you kidding me??!! These look…soo….good! I love Twix. As a kid I could eat..umm…TONS of them. They were one of my fave candy bars ever! Wow, this honestly sounds like the best brownie recipe ever. Twix are amazing on their own let alone in brownie form! I’m not sure I could have eaten JUST one before the party, these sound delicious! This is a splendid idea. I love Twix bars and am excited to try them in brownie form! I could totally go for one of these right now as my breakfast! Who wouldn’t love twix bars mixed into a brownie? SInful! Cracking on brownies is perfect! It is 8:30 in the morning and now I am so hungry! If only I could have one for breakfast! They look so good! Hope you’re doing well, Maria!! woa, woa, woa – the prof would really love these! I love candy bar brownies! Doesn’t get much better than that 🙂 Hope you have a great day Maria!! These look SO GOOD! I seriously want these right now! Twix is the best, but in brownies?!! Even better! Yum! Thanks for the link love. I actually did Twix Bar Brownies before, but not with that yummy added caramel! Great job! These look absolutely delightful. Love love twix and I have been craving brownies recenty too! I’m a Twix fanatic, too. I don’t eat candy bars often but you can’t pass up a Twix. Great recipe! Twix were my FAVORITE candy bar growing up. Love these brownies! These make me want to turn on the oven, even if it’s 108 degrees outside. YUM!!! I’m about three seconds away from cancelling my entire day, making these, and eating the entire pan! Great job… I am pretty sure I am now in love with a brownie. This is brilliant! Twix bars are completely overlooked in the baking world. twix are one of my favorite candy bars! Twix are Abe’s favorite! I will for sure be making these 🙂 MIss you! I will be calling you soon to catch up! Oh my sweet goodness. Two of my favorite things in one. 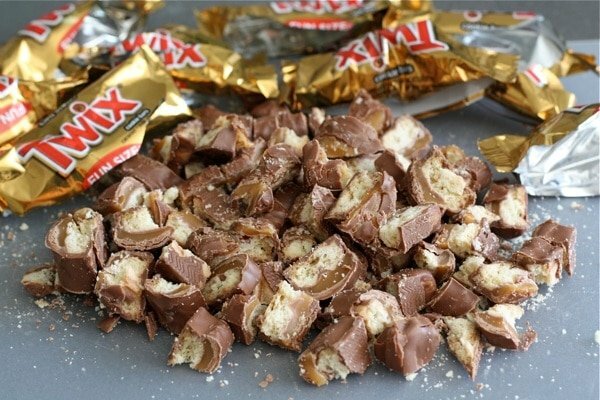 Twix bars are being added to my shopping list so I can make this soon. OMG. these are sinful. I could eat these by the plateful right now! All I can say is that it’s a good thing I did not read this post while my teenagers were home. One look and I’d be forced to drop everything and make these…. Now at least I can do it on my schedule since they do look, sound and I am sure are fabulous!!! Too good! These look delish. I can’t imagine these with a class of cold milk… ummm! GASP. My favorite candy bar…wrapped up in a decadent brownie. I’m definitely spoiling my dinner just by *reading* this post!! 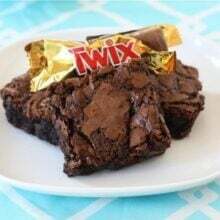 I LOVE Twix bars and sometimes get cravings for them… I definitely have a craving for these brownies now! I’ll have to make these for an office party or gather with my friends! Perfect timing! I was just telling my friend that I had a huge craving for brownies yesterday and these are calling my name! These look and sound amazing! Can’t go wrong when you add candy bars to brownies in my opinion. 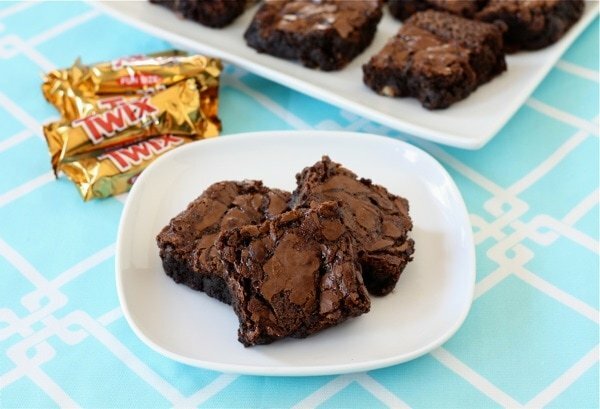 Twix bars are one of my favorite… These brownies look amazing! I’m salivating already. My favorite candy bar in one of my favorite desserts. Yum! I love these. I love twix and Brownies + Twix = awesome! These are definitely in the absolutely 100% amazing category! I love twix but haven’t had them in forever…I think it’s time. These sound so good! I love the combination of brownies and caramel! Oh my, these sound so good! I love brownies and I love Twix, so together they sound sinful! My goodness, these brownies look incredible! holy smokes !! i love caramel, actually the word LOVE isn’t even enough to express how much i really really really really really feel. i wish i could just reach into the screen and grab one! These brownies are in a class by themselves! They look amazing! It’s swimsuit season….why must you do this to us!?! I’ve got one word for this….HEAVEN! How fun!! These looks fabulous, I think they would be very dangerous to have around, definitely wouldn’t keep for very long! I do something similar with Toblerone candy bars and they are always a huge hit! I love Twix too! I also love them mixed into chocolate chip cookies :). Do you think it will still taste as good without the caramel sauce? Whoa….those look AH-mazing! And totally irresistible! Oh wow, my mouth is watering! 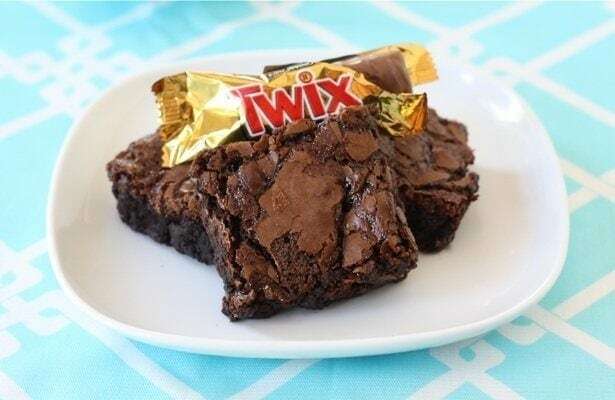 Twix and brownies are two of very favorite treats – awesome idea to combine them! Is it okay to leave out caramel sauce? YES. PLEASE. Twix are amongst my all-time favorite candies – and brownies, my all-time favorite dessert! These look amazing…I am a sucker for brownies so I will definitely have to try these! I think these will be perfect my sisters baby blessing. Thanks for sharing! Woohoo! These sounds amazing. I love Twix- did they candy bars stay crispy after baking? Twix are one of the few candy bars I will pick out of my kids’ Halloween baskets – I love them! What a great idea to make brownies with them – these would be dangerous for me. I’ve been trying to avoid this recipe, but it keeps calling out to me. And so I bought Twix today. 🙂 Can’t wait to try them! Twix are some of my favorite candy bars. These look fabulous! TWIX IS MY FAVE!!!! THIS LOOKS DEADLY SINFUL I DONT EVEN WANT TO THINK ABOUT THE CALORIES BUT YOU KNOW WHAT I WOULD TOTALLY MAKE ONE OF THESE YUM! Looks delicious! Wish I could eat Twix. Guess I’ll just have to make my own so I can make these brownies. Made these tonight and they are SOOOO rich and divine. But mine seemed to just fall apart and there was NO way to keep them in a nice bar form, even after totally cooled. I ended up with a sort of pile of brownie hunks instead of bars. Any advice on this? Maybe I used too much caramel sauce (I didn’t exactly measure 1/3 c. I just poured it on!) or something? I’ve never met a brownie I didnt like. But these are at the top of that brownie list! Bet they were gone in no time at all. Cannot wait to try these, look wonderful. I’ve recently found your blog and you have tons of great recipes. Just wondering for these brownies, did you use sweetened or unsweetened cocoa or does it really matter? Thanks Niki! I used dutch processed cocoa because that is my favorite but regular unsweetened cocoa will work too! Hey quick question…I made these brownies tonight, and I’ve also made your zucchini brownies…which tasted fantastic. 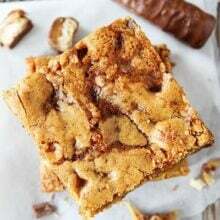 My question is that I can’t seem to make really fudgey/chewy brownies. I follow the directions exactly, but they come out more like cake than brownies. What am I doing wrong? Pingback: I Want My Kitchen Back! – Sprinkle Joy. Just made these today. WOW! 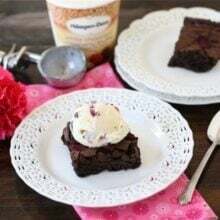 Just the brownie recipe by itself is a solidly delicious one bowl brownie, but the addition of candy bars and ice cream topping sends it wildly over the top. I baked them as is this time, but I’m already imagining the myriad of possibilities for the future: Jr. Mints and marshmallow topping, Heath Bars and caramel, I could go on and on . . . . Thanks for this great recipe and I love your site. I used dutch processed because that is my favorite. Unsweetened would work too! Enjoy! I’m dying for some chocolate right now and these sound like they’d hit the spot. I make something similar only instead of using Twix bars I use Milky Ways. Soooo Good! How lucky is this little boy on the way? Caramel, chocolate and a mommy who knows how. I made these this weekend for hubby’s b-day party…….they were a HIT!! They were easy to make and oh so yummy!! But I hafta say……yours are a lot prettier than mine!! My brownies looked “marbled” with the caramel……but I see yours don’t have that appearance. (Does that make sense?) Anyway……they were yummy and I guess I’ll just HAVE to make these again to see if I can get mine to look like yours!! Thanks for the awesome recipe!! They tasted good and that is all that matters, right? 🙂 I am sure they looked great! Wow… not only do those look delicious they seem fairly simple too! Thanks for posting! FUN! PS. I’m new to your blog and all your posts look delicious! Bookmarked and can’t wait to try out the recipe tomorrow! Question though; would it matter if the butter’s melted by double boiling or it’d be better if melted? Cheers! These look absolutely delicious. With Halloween coming up, this could be a great idea to make for the kids. Thanks! You did a great job with this, the tow favorite sweets together, thanks for sharing. I just made these and they’re fantastic! I didn’t have any caramel so I added chocolate chips to keep up the indulgence level. They baked up wonderfully (with a gorgeous smooth and craggy top, if that’s possible). After a bad day, I needed a perfect recipe…thank you so much!!! these look absolutely amazing!! just wondering…what kind of cocoa do you use? unsweetened? I used dutch processed cocoa. I made these tonight. THEY. ARE. AMAZING!! I have followed you for the past few years and have yet to be disappointed by anything I’ve made of yours. I tell others about your site all the time. thanks for being so good at what you do. Ok first… Holy snot that looks perfect! Third, I think that being able to wait until they were cool and cut is WAY more self control than I would have had. Keep up the chocolate amazingness! Saw these on pinterest, made them for the Super Bowl and blogged it with links to this post and your home page! I made these for the second time tonight, and since I didn’t have Twix bars, I used Reeses PB cups. These were a hit too! 🙂 Thanks! omg… i just stumbled upon these… while i’m on a no sugar challenge for 2 weeks.. and training for my first 5k. but let me tell you as SOON as that is done I WILL be eating these! I did this with Reece’s instead of Twix…. a-m-a-z-i-n-g! Pingback: Twixbrownies met karamel | Yummy in my Tummy! I’ve been exploring for a little bit for any high quality articles or blog posts in this kind of area . Exploring in Yahoo I ultimately stumbled upon this site. Reading this info So i am happy to exhibit that I have an incredibly excellent uncanny feeling I found out exactly what I needed. I most indubitably will make sure to do not forget this web site and provides it a glance regularly. So, how many chopped Twix bars in a cup and a half? Omg these brownies were out of this world… Made them for family gathering lastnight and they were a hit. Two were left and I had to hide them for my cousin to have who hosted the party and lied to his brother and told him they were all gone!! Lol this way he could have a midnight snack! Thanks for posting! This is a keeper! These look yummmy!! Thanks!! Can you make these using the peanut butter bars too? If so, how? Thanks!! 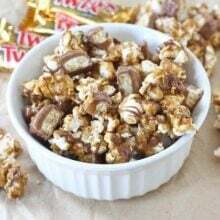 I have been making this recipe of yours for a long time now, sometimes with the twix bars and caramel, sometimes with just a handful of chocolate chips instead. I had to comment that I quadrupled this recipe to make dessert for my son’s marching band. They are marching in a competition today. To say it was a hit with hungry teenagers is a huge understatement! Love this recipe! It was super simple to quadruple too!! Love your site! Hi Andrea-I am so glad you like the brownies! I hope your son’s band did well in the competition! Thanks for reading our blog!